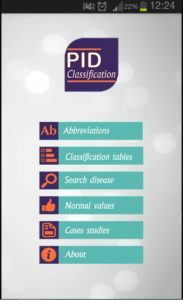 Our colleagues and friends from the African Society for Immune Deficiencies (ASID) and from HAJAR (Moroccan PID patient group) recently developed a mobile app to help physicians diagnose and classify primary immunodeficiencies (PIDs). Prof Aziz Bousfiha and Dr Leila Jeddane (Clinical Immunology Unit, Hassan II University, Casablanca, Morocco) are the leaders behind this project that used research from many prominent PID specialists from around the world. The December issue of the Journal of Clinical Immunology included an article about the app and its launch was announced at the 1st Maghreb and 9th Moroccan PID Congress in Casablanca. 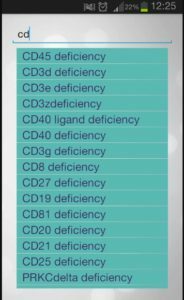 The app’s aim is to help physicians better understand PIDs and it will especially be valuable for physicians who do not see many PID patients.